Electronic cigarettes are nothing new, but that doesn’t mean new technology cannot be introduced into the genre to help those who want to cut down on their puffing or even quit the habit altogether. 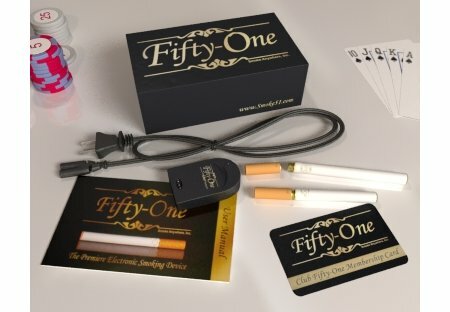 Fifty-One has released its latest electronic cigarette that could possibly help you kick the habit, assuming you’ve already tried other models in the market to no avail. What makes this version different from the rest is the ability to choose from a wide range of flavors and nicotine levels, letting you slowly but surely cut down on your daily fix until you feel that you are no longer nicotine-dependent. Let’s read more about Fifty-One’s electronic cigarette right after the jump. For starters, the Fifty-One electronic cigarette looks and feels like the real thing, making it comfortable to use with long time and new smokers alike. It comes in two components – the first is a rechargeable battery while the other is a disposable cartridge, and inside the latter you will find the nicotine pad and atomizing mechanism. Once the disposable cartridge has outlived its usefulness, all it takes is a simple screw off action and putting on the new and you’re good to go. A major benefit of this mechanism is the atomizer is never reused, so you don’t have to worry yourself even more with other problems including nicotine residue, build-up and clogging. Users will users draw in a “vapor” that is dense enough even to be noticeable when exhaled, although it isn’t classified as smoke, making this useable even in non-smoking areas. On the bright side, you also won’t need to fork out for tobacco excise taxes and health-impact fees when you pick up the Fifty-One electronic cigarette, and there is no risk of burning anything since no fire is involved. The starter kit will come with a couple of nicotine cartridges (available in various strengths: 8 mg., 6 mg., 4 mg. and 0 mg.), where you can choose from tobacco, menthol, chocolate, vanilla and coffee flavors. I should clarify that “liquid” inside … it’s not totally runny, but more like a thin syrup-kind of thing. Are these cigarettes legal for sale in Canada? Since there is nicotine in there, like the patches aren’t we supposed to have a DIN (drug identification number) for it to be sold in pharmacies? An excellent innovation for smokers! RuToo has produced the first electronic cigarette that truly looks like a cigarette. The new RuToo SH2 Minismoker is 89 millimetres long and weighs just 8 grams. You can barely tell the difference between a normal cigarette and the RuToo SH2. By ordering the Rutoo SH2 startkit you get 25 cartridges for free! I bought one of these and they are actually really awesome. There is no runny nicotine liquid. I’ve thrown the cartridge around and sucked on it dry. Nothing comes out. Second, there’s no smell to it at all. You can probably smell moisture, since it’s 99% water, but other than that, there isn’t any form of smell. Also, with the 51, you end up exhaling a LOT of vapor, which is really cool because I love doing smoke tricks. I just purchased the fifty one kit & no instructions came with it. I do not know how to use it. Can someone help?? ?